These 5 tips can help you curb your spending and boost your savings—without feeling pinched. 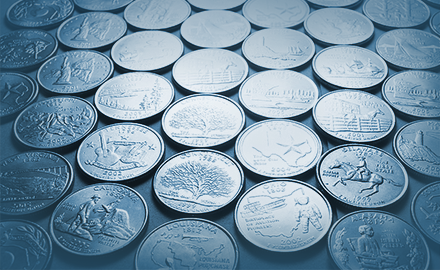 At any given time, the average U.S. household has about $90 of loose change lying around! Encourage everybody in your household to deposit their spare change in a central location for a set period of time, like 6 months. Make it a semiannual family tradition to count and roll the coins. When you're done, cash in and deposit the money into your child's 529 plan account. How many bills do you pay a month? If you pay 5 bills a month by check, you'll spend $2.45 a month on postage (almost $30 a year). Pay as many bills as possible electronically (many banks offer an electronic bill pay service that can even be used to pay individuals); then do the math—figure out what you had been spending on postage a year compared with what you'll be spending now and deposit the difference into your child's 529 plan account. Many people complain of spending too much, but you rarely hear someone complain of saving too much! Try equalizing the amount you spend and the amount you save. For example, if your family spends an average of $200 a month on nonessentials like eating out and going to the movies, hold yourselves accountable to save at least $200 a month, too. While it's important to have a long-term perspective, sometimes it can be easier to stay on track if you break your long-term goals into more manageable short-term goals. If your goal is to save $1,200 in your child's 529 plan account per year, focus on saving $25 a week. Achieving your weekly $25 savings goal can give you a sense of satisfaction and motivate you to continue working toward your long-term goals. Even the best, most dedicated savers occasionally splurge. To make sure your "splurges" are affordable and well thought-out, institute a waiting period before making a purchase over a set amount. For example, if you're tempted to upgrade your cell phone to the latest model for $100, make yourself wait a day or two before handing over your device. Putting some distance between the purchase itself and the impulse to make the purchase could prevent you from making hasty decisions. And, you guessed it—consider depositing the money you save on not making impulse purchases into your child's 529 plan account.